I have a slight obsession with Middle Eastern food right now, and with good reason. It is a style of eating that is absolutely jam packed with big bold flavours and flavour combinations that are mind-blowing. 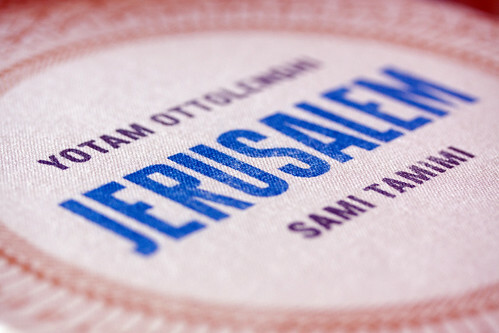 One of my most used books is the beautiful Jerusalem by Yotam Ottolenghi and Sami Tamimi. Ever since I baked the Chocolate Krantz Cake barely a week has gone by when I haven’t pulled this book off my kitchen bookshelf and cooked/adapted a recipe from it. It is a beautiful book indeed filled to the brim with recipes to excite the senses and make the mouth water, stunning photography, snippets of the life and culture of Israel and enchanting stories as Ottolenghi and Tamimi explore the flavours of their childhood. “The flavours and smells of this city [Jerusalem] are our mother tongue: wild herbs picked on school trips, days in markets, the smell of the dry soil on a summer’s day, goats and sheep roaming the hills, fresh pitas, chopped parsley, chopped liver, black figs, syrupy cakes, crumbly cookies” Ottolenghi & Tamimi. Ma’amul (or Ma’amoul) the end of Ramadan (Eid al-Fitr) speciality, are probably the mot popular of the Arab cookies, and there are many, many of them. 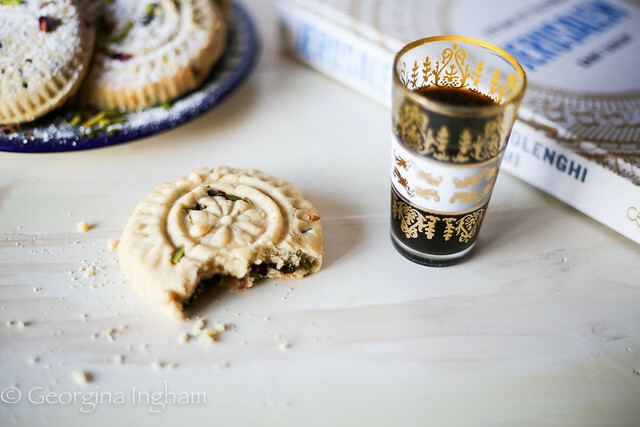 Ma’amul are crumbly shortbread style biscuits made with semolina and/or flour which are stuffed with nuts or dates and daintily decorated either by use of intricate moulds or by hand painstakingly with tweezers. 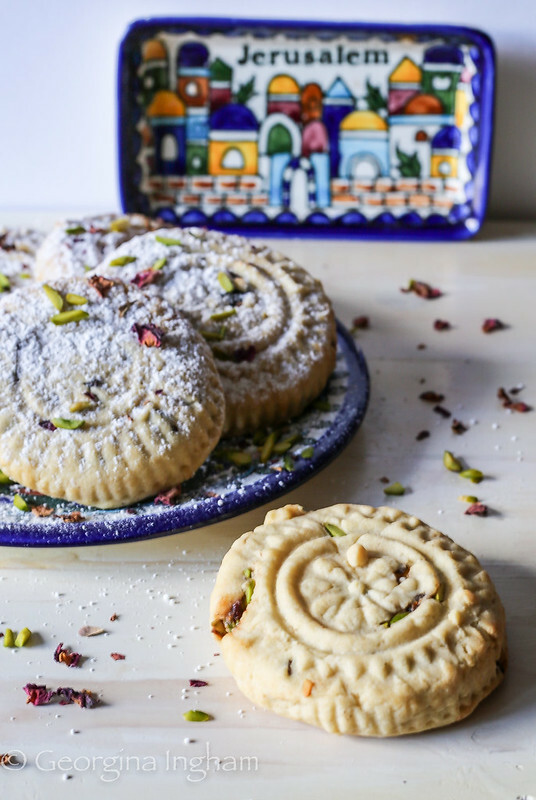 According to the book Sami Tamimi clearly remembers a lady whom the children used to refer to as “auntie” who used to visit all the houses in his neighbourhood towards the end of Ramadan to help the housewives make these cookies. The women of the extended family used to work together in groups, gathered around ‘auntie’, chatting whilst making vast quantities of ma’amul to make sure that there were always cookies on hand for passing guests and some for the poor, or those who couldn’t afford to make their own. He also remembers that there would be platters of cookies piled high everywhere, “white with fresh icing sugar, like little snowballs” (Sami Tamimi). As I’m sure you’ll know I have neither the skill or the patience to start decorating by hand so I bought a nice decorative mould from the Aladdin's cave that is Persepolis. Now, I’ve only shopped online at Persepolis, but if you’re local to Peckham I’d advise you pop in to Sally’s shop as I hear it is an amazing place, plus they also have a small cafe with a divine sounding menu, be aware the menu changes frequently. Traditionally for ma’amul the date variety is round and flat whilst the nut one is high and domed. 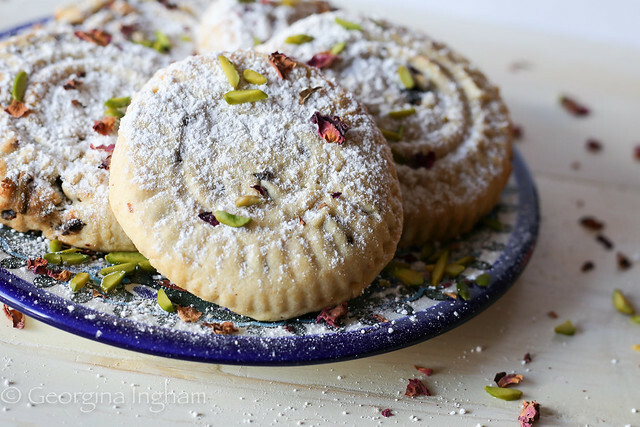 According to Ottolenghi & Tamimi this recipe lacks the dainty finish of the traditional version, but they do have the typical short and dry casing with moist and nutty centre and floral aroma. Unusually they mix together the nuts and dates but with great success. 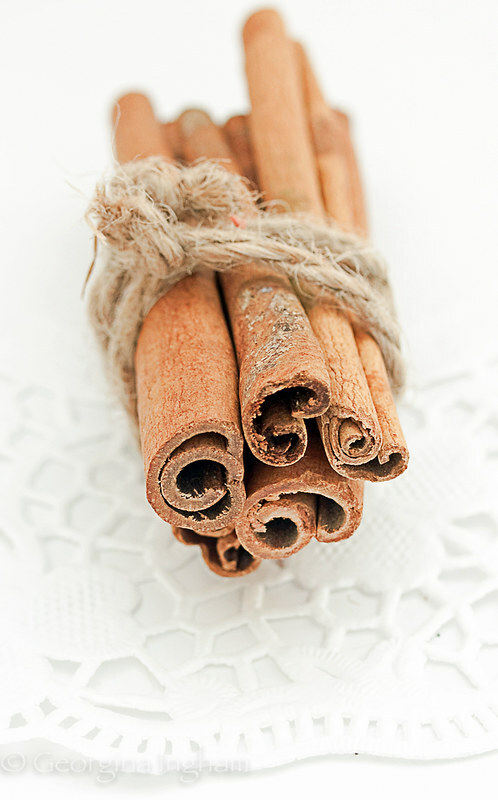 Despite this version being fairy quick and easy to make they taste incredibly special, but then again how could anything heady with rose water, orange blossom and cinnamon not do? They could, with a little imagination, be likened to the trusty British fig roll; albeit a much fancier more exotic version. 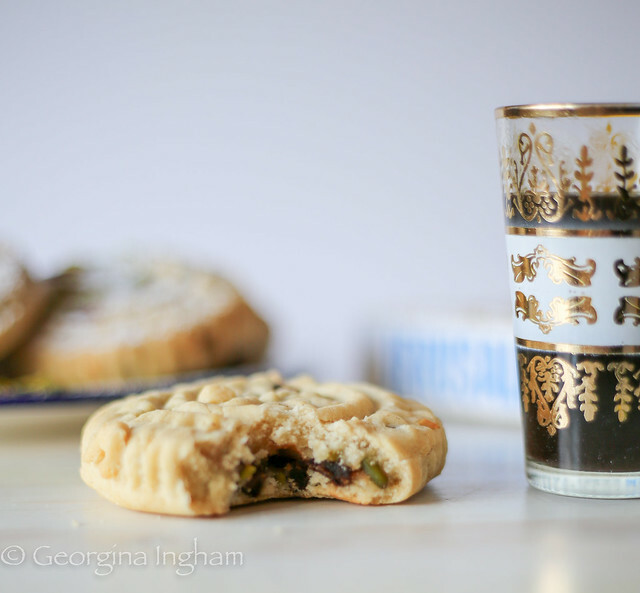 I like to serve my ma’amul with either cardamom tea or strong, black Turkish coffee as an light mid afternoon snack but these beautiful cookies are perfect for any occasion. Probably the most popular of Arab cookies. Ma'amul are short biscuits made with semolina and/or flour, stuffed with nuts or dates and daintily decorated. 1. Put the semolina, flour, 40g of caster sugar into a large mixing bowl and stir together. 2. Cut the butter into cubes and add this to the flour mixture, work with your fingers until the texture is like breadcrumbs. 3. Add 2 tablespoons of orange blossom water, 1 tablespoon of rose water and 1 tablespoon of water and use your hands to bring the mixture together into a ball. 4. Remove to a clean surface and knead the dough gently until smooth, approximately 5 minutes. 5. Cover the dough with a damp cloth and leave to rest for 30 minutes. 1. Place the pistachios, dates, 50g caster sugar, cinnamon, 1 tablespoon of orange blossom water and 1 tablespoon of rose water in a food processor bowl. 2. Blitz until you get a coarse paste. 2. Get a bowl of water ready so that you can keep your hands damp while you work, to help prevent the dough from cracking. 3. Divide the dough into approx 30 pieces of equal size. 4. Take a piece of dough and roll it into a ball. Flatten it in the cup of your hand and turning it around as you do so, use your thumb to press it flat and then lift the edges to shape a little 'pot'. The sides need to be about 2.5cm high and 3mm thick. 5. Fill the pastry pot with a heaped tablespoon of the filling. 6. Pinch the dough over the filling so that the pot is sealed and then gently roll it into a ball again. 7. Flatten the ball between the palms of our hands, the sides now need to be around 3cm high and, either place directly onto a baking sheet lined with baking paper or place into a ma'amul mould and press down lightly to indent the pattern before tipping onto the baking tray. 8. Repeat until you have used all the pastry/filling. 9. If you haven't used a mould, take a fork and press down gently on the top of each cookie to make like patterns with the tines. 10. Bake for 12-14 minutes. The cookies need to be cooked through but care must be taken to stop them taking on any colour. 11. Remove from the oven and transfer to a wire rack to cool before dousing liberally with icing sugar and serving.